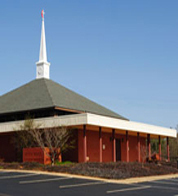 Ebenezer UMC in the Dudley Shoals Community is committed to the preaching and teaching of God’s Word. Our Sunday school and other Bible study groups are thriving. This is one reason we recently added a new education building with more classrooms and a larger fellowship hall and kitchen. Small group studies are scheduled throughout the year. Adults often move between the Sunday classes for special studies, too. Our Sunday school groups and other groups do more than study God’s word. They have their own ministries that they carry out, along with supporting one another emotionally, spiritually, and physically as needed. Sunday School -- 10:15-11:15 a.m.
United Methodist Women (4th Sunday of month) - 7:00 p.m.
United Methodist Men (3rd Sunday of month) - 3:30 p.m.
Children's Bible Study - 7:00 p.m. Adult Bible Study - 7:00 p.m.
New Life Praise Band -- Rehearsal time is Wednesdays at 6:00 p.m. Adult Choir -- Rehearsal time is Sundays at 6:00 p.m.
We have Vacation Bible School for 3-5 days every year in the summer. This event is a way for us to introduce children of all ages to God and His Son, Jesus. Classes are available for all age groups, including adults. We serve a free, light supper each evening, and have a cookout on Commencement day. There are age appropriate activities, crafts, and games for all the children; plus short dramas acted out by our members to help re-inforce the lessons. Please keep an eye on our news page around June of each year, so you can be ready to join us for the fun and learning. We have a Christmas play every year with our children and youth as the actors. Any child in the neighborhood may participate. Check in the fall of the year for more information for the upcoming play.